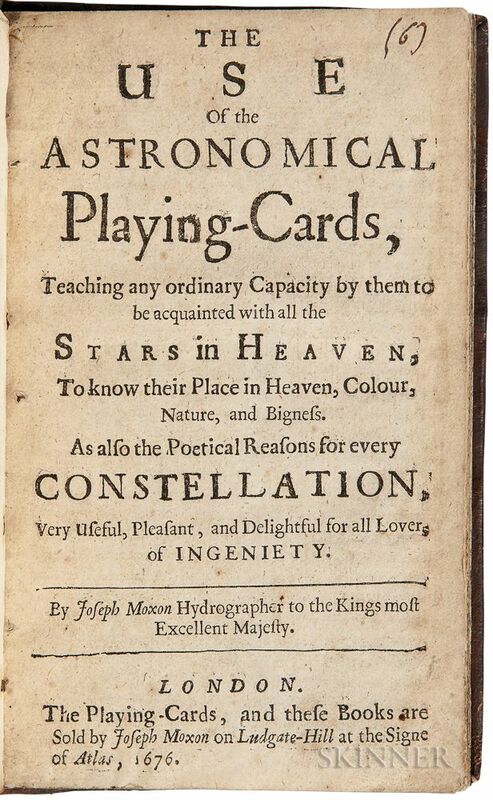 Moxon, Joseph (1627-1691) The Use of Astronomical Playing Cards. London: The Playing-Cards, and these Books are Sold by Joseph Moxon on Ludgate-Hill at the Signe of Atlas, 1676. First edition, octavo, rare, two U.S. copies and one U.K. copy in ESTC, Harrison D. Horbilt copy, with his bookplate, bound in full speckled sheep, rebacked, 6 1/4 x 3 3/4 in. 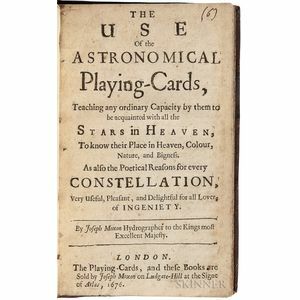 In this work, Moxon describes methods for finding major stars and constellations by using his astronomical playing cards. The four suits are Spring, Summer, Autumn, and Winter, based on the position of the sun. The cards themselves are quite rare. The Schreiber Collection at the British Museum has one incomplete and defective late 17th century set.